JNN 16 Aug 2014 Manama : Shia Population of Bahrain have waged a protest rally to voice their outrage over Saudi Arabia’s persisting crackdown on the Shia population in the US-backed Persian Gulf country. The protesters took to the streets in Sitra Island on Sunday to show solidarity with the Shia Saudi cleric Sheikh Nimr al-Nimr, who has been in prison for two years. Sheikh Nimr has been sentenced by Saudi Arabia to death. Sheikh Nimr was attacked, injured and arrested by Saudi security forces as he was enroute to his Residence in the Qatif region of Saudi Arabia’s Eastern Province on July 8, 2012. He has been charged with disturbing the country’s security, giving anti-government speeches and defending political prisoners. Riyadh has recently sentenced several Shia Muslims to prison over what authorities call insulting the country’s national flag. The February 14 Movement of Bahrain issued a statement calling on the international community and human rights organizations to try and save the life of top Saudi cleric Sheikh Nimr Baqr al-Nimr. It also urged all the noble people of the world and the religious authorities in the Arab and Muslim world to take steps to save the Shia cleric’s life. The movement also warned the Saudi government against the consequences of a possible death penalty for Nimr Baqr al-Nimr. Saudi security forces arrested Nimr Baqr al-Nimr in July 2012 and have kept him behind bars since then. The prominent cleric is reported to have been under torture. Meanwhile, there have been reports that a Saudi prosecutor has demanded the death penalty for Nimr Baqr al-Nimr. This entry was posted in Middle East and tagged Death Verdict, Saudi Arabia, Sh Nemir Al Nemir, Sheikh Nimr, Shia Population. Bookmark the permalink. I WROTE THE FOLLOWING APPEAL AND SENT TO MOST REVEREND AYATOLLAH SISTANI AND AYATOLLAH KHANAMEI TO WARN THE TAKFIRIS THAT THERE IS A LIMIT AND IF THEY TRIED TO HARM THE REVEREND AYATOLLAH NEMIR , THEN THE CONSEQUENCES WILL BE UNCONTROLLABLE . SHAHADAT IS OUR WAY OF LIFE AND WE SHOULD NOT HESITATE TO START A WORLD WAR IN DEFENDING OUR MOST PIOUS AND RESPECTABLE AALIM . I BEG THE MOST REVEREND AYATOLLAH SEESTANI ( rehmat Allah ) AND THE AYATOLLAH KHANAMIE (rehmat Allah) , ON WHOM OUR SOULS BE SACRIFICED THAT THEY SHOULD IMMEDIALY ISSUE A STERN WARNING TO THE ILLEGITIMATE JEWISH TURNED IMPOSTER ARAB KING THAT THE MOST REVEREND AYATOLLLAH SHEIKH NEMER BE RESPECTFULLY SET FREE OR ELSE WARN THEM THAT DESPITE THEIR PROBLEMS WITH THE MOST EVIL ABU BAKAR BAGHDADI WHICH THE IRAQ IS TACKLING WITH , THAT THEY WILL NOT HESITATE TO CONVERT THE NEJAD, THE RIYAZ INTO A DESERT AGAIN AS MOST ARAB IS A WAST STRETCH OF SAND AND DUST . THEY IF RELY ON EVIL FOREIGN POWERS, THEY SHOULD KNOW THAT THEY ARE NOT FOOLS TO PUT THEIR MEN AND MATERIAL TO WASTE AND BE MIXED UP IN THE SANDY DESERT OF MUD WITH THEIR OWN BLOOD . PATIENCE , TOLERENCE AND MAGNANIMITY SHOULD NOT BE TAKEN AS WEAKNESS. IT WILL TAKE ONLY A FEW MINUTES TO CONVERT NAJED INTO HIROSHIMA , NAGASAKI . IF YOU ARE ALL OUT DROWN IN GIN OR WHISKY , BUSY WITH YOUR INNOVATED MISYAR , INDULGING IN PEODOPHILE AND GAYISM , IT IS NOT OUR CONCERN , GO AHEAD AND FACE THE DIRE CONSEQUENCES IN YOUR HEREAFTER BUT IF EVEN A SINGLE STRAND OF AYATOLLAH’S HAIR IS HURT THEN YOU WILL HAVE TO FACE THE HELL HERE AND NOW . THE ENTIRE MUSLIM WORLD SHOULD NOT ONLY PROTEST BUT WARN THE WAHABI INFIDELS THAT EVEN A HAIR IS HARMED OF THE MOST REVEREND AYATOLLAH , THEIR ROYALITY WILL BE TOPPLED UPSIDE DOWN THEY SHOULD NOT DEPEND ON WESTERN POWERS , THEY WILL NOT BE ABLE TO HELP YOU IN DISTRESS.BETTER COME TO SENSES . A COMPLETE REVOLUTION WILL TAKE PLACE, RIAZ WILL BE NO WHERE ON THE MAP . 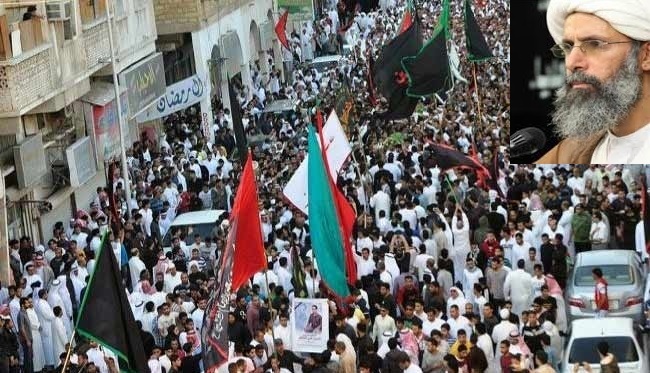 Jafria News posted: “JNN 16 Aug 2014 Manama : Shia Population of Bahrain have waged a protest rally to voice their outrage over Saudi Arabia’s persisting crackdown on the Shia population in the US-backed Persian Gulf country. Zaheer Hussain there is nothing known as Shia Islam.